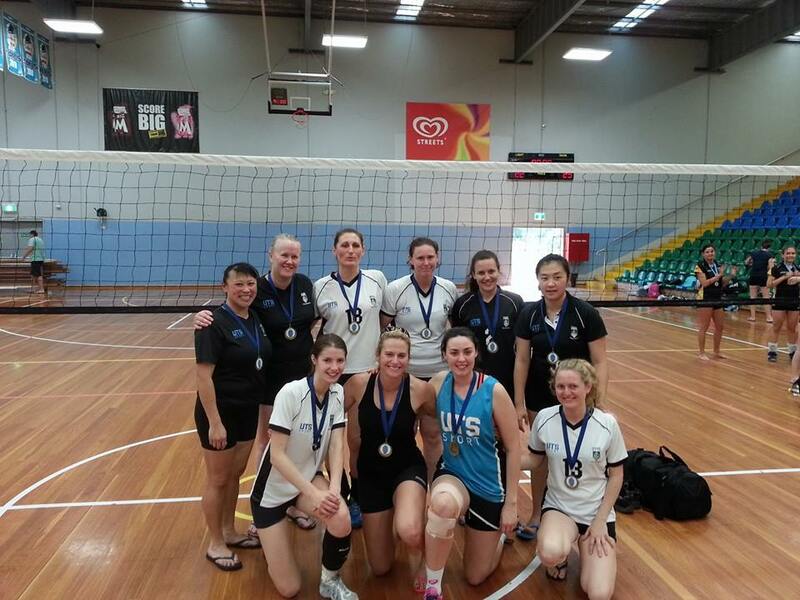 On the weekend of 12/13 October a small but merry band of volleyballers made their way out to Penrith for a State Cup. With the SVL season over and only a few weekend tournaments left for the rest of the year, the UTS women were only able to field one team into the Penrith State Cup last weekend which was made up of players from all 4 UTS teams: Honours women, Cougars and Cubs, Div 1 and Div 2. Saturday saw the UTS team play 3 games, easily defeating UNSW’s Division 1 team and Endeavour but losing to Manly in the grueling afternoon heat to finish 2nd in the pool and progress to the Honours division of the competition. A tiring but fun day was had by all of us getting to know each other and understanding the rules of a new venue (in 25 years of playing volleyball, I’ve never had to deal with a “Big Arse Fan” rule before). Claire Lu and Verena Taudte really stepped up to the plate to match it with the rest of the players with some impressive serving and setting. Jess Reardon and Nardia Guillaumier made impressive returns to the middle with Haley Minigle and Irina Penkina solid on the outside. Jenny Towers was consistent and showed her experience (as always!) in the setting position. A very early morning start on Sunday at 8am saw the team lose its first Honours round game to the UNSW Honours team 2-0. Despite the set score, the team was competitive all the way and only narrowly lost each set. The team managed some good play but struggled at times with passing the UNSW float serves. However, some handy reinforcements (Clara Loth and Natalia Krivonogova) arrived in Penrith in time for the 11am game against Manly. We were then able to move Jess Reardon to Universal and run a quicker attack. Great setting from Verena and Jen got the middle hitters firing, resulting in a strong team performance and an easy 2-0 win. Most outstanding dive goes to Jen for an impressive backwards roll after tripping over her own foot during a rally. Next came the SVL Div 1 gold medal rematch against Hills Dragons. Great passing from Clara and strong play from Jen and Nardia (who were rejuvenated after taking advantage of some sports massage during the break) helped the team gel together. Awesome defence from Haley and big hitting from Irina lifted the team to play some inspired volleyball. The girls showed great patience against the strong defensive Hills girls to take out the match 2-0 and progress to the Honours Gold Medal match. The girls didn’t let it bother them that they were going into the Gold Medal match against the UNSW Honours girls as underdogs. A great defensive effort from all players highlighted by a huge dive outside the court by Claire Lu saw the team lift its intensity and put continual pressure on the UNSW girls. Nardia made some HUGE blocks against AVL middle Kelly McLeod to keep her out of the game. After taking the first set quite easily, the girls went neck and neck with the UNSW girls in the 2nd set before letting the opposition slip away in the middle of the set. 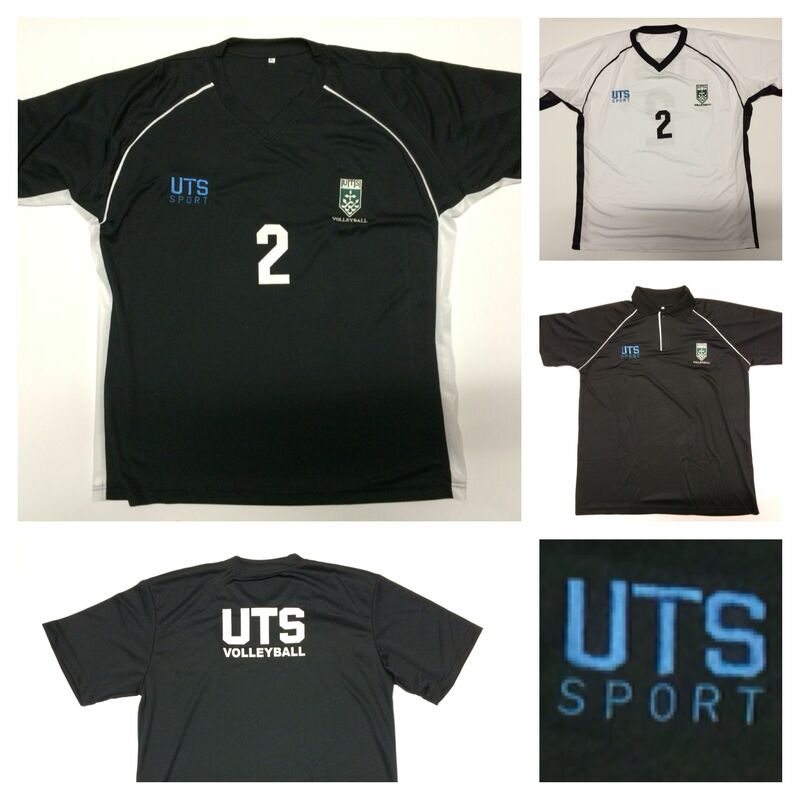 However, with some “no regrets” volleyball, the UTS girls made a big comeback to take the 2nd set and match. A great weekend and result. After 7 games in 2 days, I can hardly walk but thanks for the good times – bring on Good Neighbour! Round 3 of SVL is now done. How is your team doing? 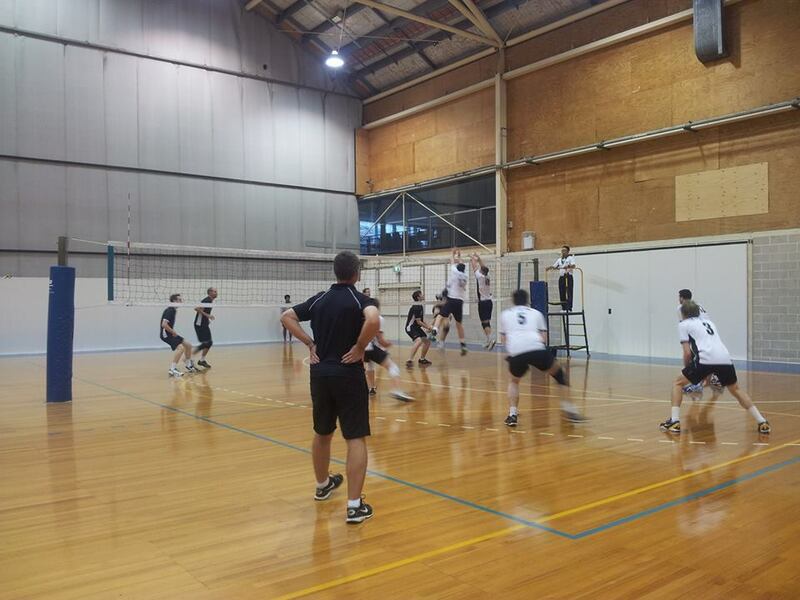 On Sunday the 22nd of June the UTS Cougars and Cubs came up against last year’s SVL div 1 champions, UNSW. It was out first early morning game of the season and we were not sure how our bodies would hold up. It seemed the cold weather was not helping during the first set as everyone was able to get their first serve in but struggled with their second, lucky we were able to hold it together and win the set comfortable 25-17. With some great attacking from Yoshi (lets hit the ball so hard and fast the lines person will miss it) and Nardia (I like having 100 different UTS shirts to wear) on the outside and some big hits through the middle from Cat, Amanda and Kristen we were able to win the second set comfortable 25-12. Although we were 2 sets up we all know UNSW never gives up and loves to take UTS to five sets. Lucky for the cougars and possibly the cubs we were able to hold our game. With coach deb subbing on for Yoshi to play outside (even though she would of preferred to play middle), strong passing from Dani (lets not forgot the loud calls) and Joey spending more time diving on the floor and leaving the setting in Jen’s hands we won the third set 25-19. Although I don’t think we ever warmed up due to the freezing cold weather, it was a successful game. Well-done ladies. An early morning start was too early for some (a lost phone meant a missed alarm…), but otherwise we were all ready to go. Unfortunately our opponents were also very ready to go. The 3:0 (75:56) scoreline shows that we were beaten pretty solidly, but is perhaps a little unfair. While we did play some good volleyball in places, we made far too many simple errors on our side of the net. Work to do for our girls, but we know we can get better. Also: Thanks to Deb and Jess we are now able to put the setting calls into use more frequently!!! 😉 Although we should make sure to ALWAYS call them out LOUD ENOUGH (apologising to Verena! ), we did see some quick balls today, smashing middle hits into the floor. With almost no serving errors (!!!) and a all over great team effort we are looking forward to our next round, where we hopefully can show off again! GO UTS! WHITE SHIRT SUPERPOWER! This week both of our Junior teams took out their gleaming new white tops for the first time. First up, our U19 Men played against Dragons 1 and put up a really good fight, with even one set going point for point past 25:25 and giving our young boys a taste of some nailbiting tough volleyball. Eventually we went down in 4 sets to a more consistent Dragons team, but we left the court with our heads held high knowing we played some good volleyball this week. Special mention of our new ‘setter-in-training’ Khyle Blando, who did a great job playing setter for the first time and to our new ‘super-libero’ Matt Rennie, who did great playing his first match as a defensive backcourt specialist. Well done boys, you did your team and parents proud. Also, a big thanks to all of the parents who came to cheer the team on… we really appreciate your support! In the 2nd match, our Div2 Men played against the Eagles with a battle of the cousins ‘Le v Le’ on opposing sides. (Danny vs Richard) We came out strong in the first 2 sets playing some great volleyball, but lost a bit of focus in the 3rd and then managed to regroup in the 4th set, to take out the match for our first win of the season! Special mention of our new passer-hitter-libero and all-round nice guy, Jon Yaw for bringing his enthusiasm and great spirit into the team and we welcomed back Samuel Tifa to the middle, after his recovery from a neck injury a few months ago. Great teamwork all around boys and congrats on your first win of SVL! 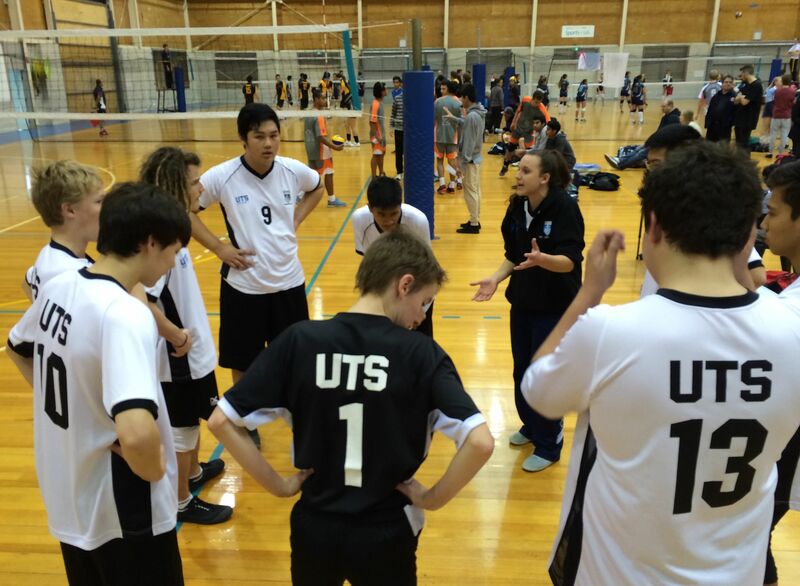 UTS-U19M def by Dragons 1, 18:25, 25:16, 26:28, 14:25. UTS-Div2M def Eagles, 25:18, 25:22, 17:25, 25:17. June 1 saw week one of SVL out at Homebush. A Rotary event made parking a challenge, but the light of cauldron warmed our hearts in the drizzly weather. Men’s honours Black won in 5 after being up 2:0. Men’s Honours White came back from 2:1 down to win the final 2 sets (40points to 17) and take their match 3:2. Women’s Honours won in 3:1 after a hiccup in the second set. Women’s Div 1 had a 3:1 win, after dropping the 3rd set. Women’s Div 1 Cougars & Cubs had a solid 3:0 win. Women’s Div 2 had a dominant 3:0 win keeping their opposition below 17 each set. Men’s div 1 had a bye. Men’s Div 2 lost 3:1 after levelling 1:1. After a great finish to the pre-season tournaments, the honours team was keen to bring that fighting spirit into SVL. We started out the game with a very strong lead, our serves and hit’s keeping them out of the game. Even when the serve was lost, we came back with some great defense and put the ball away, winning the set very convincingly. In the second set, complacency got the better of us and Sydney uni started to pick up on our attack plays. We had a few lapses in passing and defense, but managed to bring the score back to near level, narrowly losing the second set 25-23. Third started off very shaky with UTS unable to side out due to some strong, tough serving from Sydney uni. When we finally won the serve back, we answered right back at them with some epic hitting, setting and serving, allowing us to re-gain the lead. We then managed to keep the lead and take out the third set. By the 4th set, the ladies had well and truly become consistent with their tough serves, keeping Sydney out of the game. Captain Wendy managed to serve for about 50% of the set, the opposition losing all confidence with their passing which lead us to our first victory of SVL. 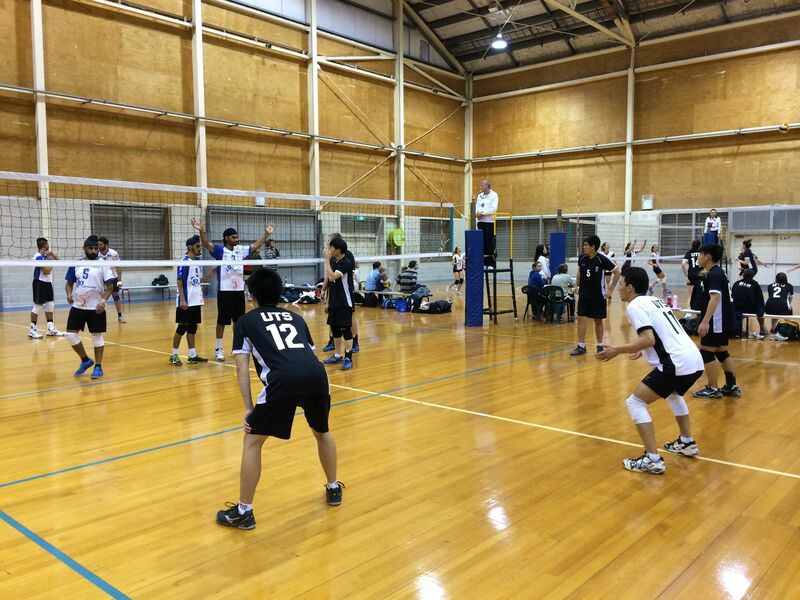 UTS Cougars and Cubs started off our 2014 SVL season in fine fashion on Sunday with a straight sets win against a steadily improving Sydney North (SNV) team in the Division 1 women’s competition. With a squad of 10 players, we were only missing our star libero, Dani Rogerson (chasing criminals again!). As I put together the line up, I came to the realization that our 10 players included 5 middle hitters – a very rare, but good ratio! With Haley Johnson nursing a minor injury, Yoshi Ueda and Nardia Guillaumier came through with solid passing and hitting to help us take out the first set relatively easily. The 2nd set proved to be more difficult with SNV lifting their game and taking an early 5 point lead. No panicking from the Cougars and Cubs (most of us are too old for that) occurred and we clawed our way back with some strong serving to be even at the 16 point mark and then surged forward with some great blocking from Kristen Manchester, Cat Stalmachowski and Jess Reardon who happily got to play universal. Amanda Gigliotti took the court in the middle position for some “training” after a 3 year absence from the game and managed to fit in seamlessly to the team, showing some great work at the net. Haley Johnson replaced Yoshi Ueda in the 3rd set so that she could leave to assistant coach the Honours Women’s team. Despite some very tight passes from the libero (sorry Joey and Jen! ), Joey and Jen managed to get some great jump sets in, drawing the block to give our outsides, Haley and Nardia and our universals, Jess and Amanda some great one on one opportunities that they capitalised on. We managed to take out the 3rd set convincingly to finalise the match 3-0. A great start for the season girls – let’s keep it up! The division two girls had a successful first game on Sunday 1/6/14. We played well and won in 3 sets. The girls were serving strongly and hitting consistently. Our training sessions definitely helped us win. Thanks Deb and Jess. Both of our Junior Boys teams started off their inaugural SVL season with much excitement and anticipation. First up was our U19’s Boys with an early 9.00am start against Dragons 2, who were just too strong for us, even though we gave a good fight going down in 4 sets. In our 2nd game our Div 2 Men played against Super Sikhs and although we played a very close game, with lots of great plays, we ended up going down in 4 sets as well. 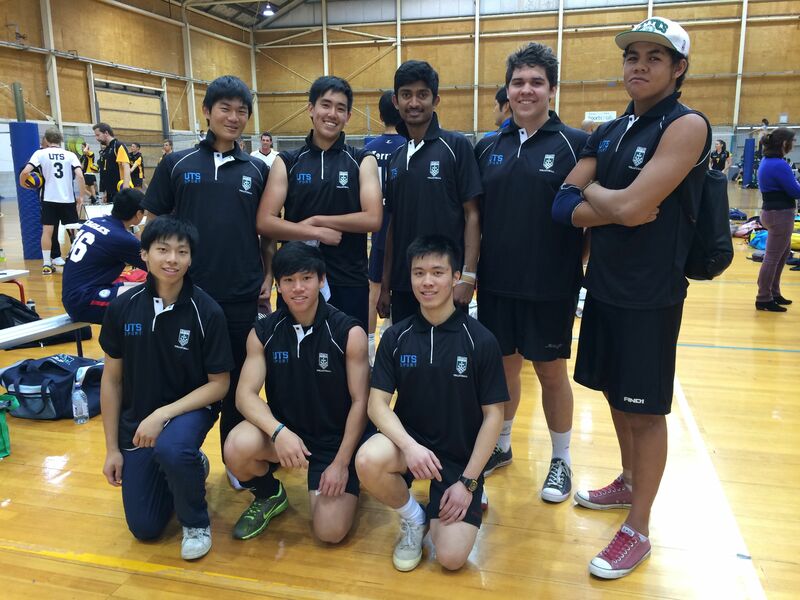 UTS-U19M def by Dragons 2, 15:25, 25:18, 16:25, 19:25. 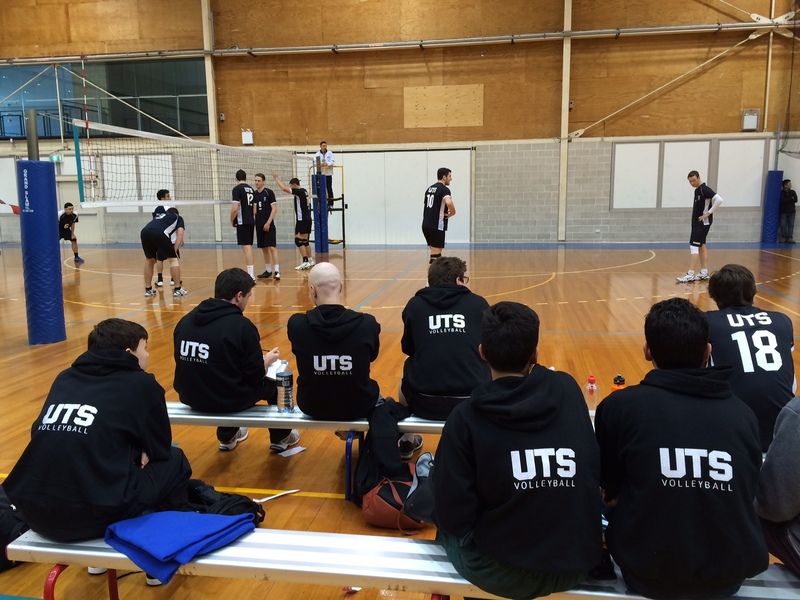 With a promising start to the season with wins against Cedars and UNSW in State Cups, UTS White were looking like a formidable opponent heading into SVL. Unfortunately a season filled with injuries, holidays and a pasty white Scottish guy, saw the White team under-perform. Rather than try to out-perform each other on the court, the boys seems to have competitions on who could sustain the worst or most number of injuries, or who could take the longest, most inappropriately timed holiday. 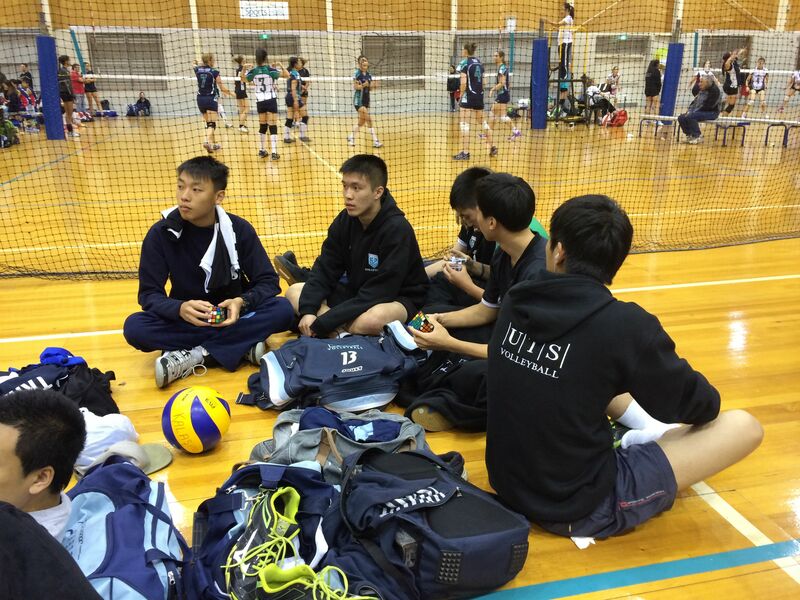 The SVL season started well with wins against Dragons, Eagles, Sydney Uni and UNSW. It was around this time that James “worst haircut of the century” McRae destroyed his knee in a drunken game of volleyball at Uni Games, closely followed by Alex “I think I can play with this” (pointing at a hand that looked more like an elephant’s foot) Gibbons, having his hand destroyed by Igor, followed by Igor “I can out-do both of you” Mileusnic doing damage to his back, shoulder and hand (as well as the destruction of millions of brain cells through the over-consumption of shots). Add to this Steve “I can’t keep my shirt on” Lee, disappearing to Canada, not only missing out on his girlfriend in a drunken pash with Nam at the end of season do, but also missing the last few weeks of the season. Captain Rob “I’m off on a baby making mission to Europe……..with my wife” Fleury decided a five week stint in Europe should be sufficient to sew the seeds of a new volleyball generation. This left the White team with just 6 players for their final game of the season. Unfortunately Gregor “I spend my whole life on on the beach and I am still WHITE!” Salvin was neither injured nor went on a lengthy holiday and thus played every game. In the end, the team did finish with a respectable 7 wins from 12 games.